Spring has sprung, and with the warmer weather comes renewed energy. Why not devote some of this energy to spring cleaning your office? Doing so will make you more productive, not just because this way, you will know where everything is, but also because a clean space is inspiring, boosts your mood, and helps you to be at your best. What’s more, maintaining a clean office sends the right message to your employees and, if you have them, your supervisors—a message that you are conscientious, capable, and get things done. It may even influence peoples’ overall opinion of you: According to a survey by staffing firm Addeco, 57 percent of Americans judge their colleagues on how they maintain their workspace. That said, here are six easy tips for spring cleaning that will fast send you on the route to enhanced productivity. The idea of cleaning your office probably doesn’t sound exciting; in fact, you’re probably picturing a lot of hard work. Instead of procrastinating, think about the end-result—how you want the finished “product” to look and more importantly, how it will make you feel (ideally, ready to tackle new challenges and projects and to work at an increased rate of efficiency). To take motivation to a new level, promise yourself a reward for starting and finishing the job. It could be something to spiff up your office—for example, an original print to hang on the wall or an attractive accessory for your desk. This reward might also be something that isn’t tied to the office itself—for example, a nice lunch at a favorite restaurant or one you’ve always wanted to try. Leave spring cleaning to chance, and you’ll achieve an end-result that won’t do much for your productivity if that. Instead, decide when the spring cleaning will occur, and commit to it, either in your appointment book or in your head. Remember, you don’t have to do the entire task at once. Breaking the job down into increments—say, 30 minutes per day for however many days you think it will take to finish what you’ve set out to accomplish—is excellent. The secret is to be realistic about your plan because setting the bar too high will probably lead to failure and decreased, rather than increased, productivity. 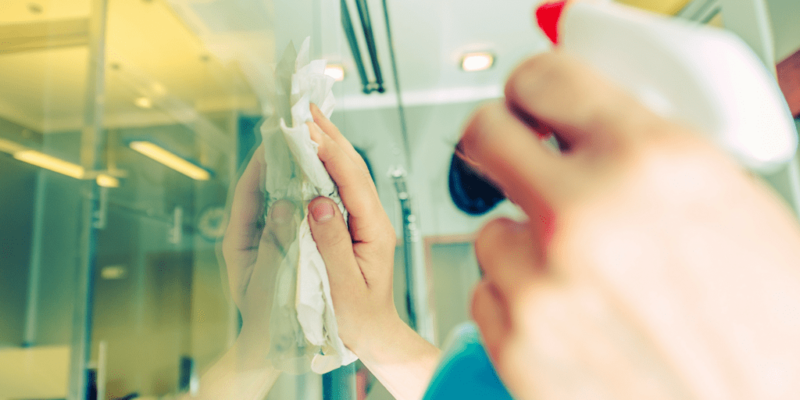 It’s easy to get sidelined on or overwhelmed by the prospect of spring cleaning when you haven’t figured out exactly how you’re going to approach it. The more you jump from one task to another without completing any of them, the less efficient you will be, and the more daunting the project will become. Avoiding this track is easy, though. Just settle on a plan. For example, if you’ve allotted 20 minutes to spring cleaning on a particular afternoon, figure out and commit to how you’ll spend that time—say, going through the pile in your “inbox” (more about that in Step 3). Then stick to it—in other words, don’t look at half of the contents in your “inbox” and then begin cleaning something else. Organizational expert Marie Kondo advises people to discard, with respect, anything that doesn’t bring them joy. The same advice goes for what’s in your office—that is, toss anything that impedes your productivity or does nothing to improve it. This means all the papers on your desk, in your physical “in” box (and maybe, your “out” box), and your drawers. It also means any paper or files that are piled up on the furniture, such as chairs, windowsills, and tables—you get the idea. Do the same with knick-knacks and other objects that are only collecting dust on your desk, and that you haven’t already thrown out because of inertia alone. Cleaning out your electronic files is just as important as clearing out physical clutter during spring cleaning. Delete old emails and files you no longer need—or put them into storage in the cloud. Put any paper you are keeping in its appropriate file. Make new folders for items that previously did not have a “home.” You might also want to create a folder or a single place to store documents you may not have time to organize in the future immediately, but can quickly address during downtime later on. This is the time to arrange your office into “zones” that work for you. For example, you may need a storage area, a space for your computer, and a spot to do reading/research, as well as space for meetings. In addition, ensure that any items you keep on your desk really belong there and won’t interfere with your productivity. For instance, maybe that plant you like is better suited for a windowsill or atop a cabinet. Part of spring cleaning is doing the job exactly as you would at home—in other words, completing a physical cleanup. Dust and wipe off the top of your desk; ditto for your computer. Attack grime that has accumulated in your drawers—there’s bound to be some. With these tips at hand, we at E-Complish are about to embark on spring cleaning for better productivity. Join us?